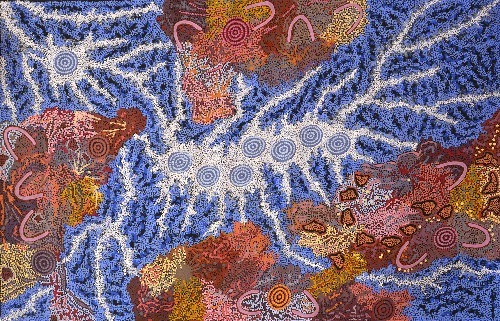 After 5 years of painting imagery and stories inspired by her Aboriginal culture, Sarrita decided to express some of the more universal concepts and philosophies taught to her by her father, the late William King. The ‘Ancestors’ painting series, is layered with dots. Markings made on the land over thousands of years can be seen entangled with patterns covering the land today, such as sand hills, flora and paths made by humans and animals. Beneath the land are the waterways that have been virtually constant over time. The river system shown meandering across the canvas, cutting through the land, are representative of the waterways found in through the lands of Sarrita’s ancestors from Katherine through the desert across to Mt. Isa. In the new Ancestors series, ‘Ancestral Pathways’ Sarrita explores the routes, landmarks and elements which the indigenous ancestors of Australia used to survive for over 40,000 years. Australian Indigenous people were nomadic and travelled vast distances for many reasons including surviving the elements, finding food and water and for sacred ceremonies.